Rebecca J. Greene ’14 and Jessica M. Parker ’15 practice staff spinning on Thursday afternoon in front of one of East Campus’s annual construction projects for REX. This structure will consist of a spinning, oscillating compartment suspended by the triangular frame. East Campus residents, has your cell phone been on the fritz since you moved back in? You’re not alone. On Aug. 6, the Cambridge City Council chose not to take action on the zoning petition which would approve construction of a new life sciences building for Millennium Pharmaceuticals at 300 Massachusetts Avenue, immediately north of Random Hall. The petition has now expired and lapsed. 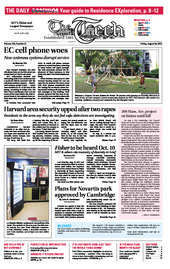 CAMBRIDGE — Harvard University is on edge and security has been increased after two rapes were reported on its normally serene campus area on Aug. 10 and Aug. 14. Last Monday, Aug. 13, MIT and 13 peer institutions filed an amicus curiae brief before the Supreme Court of the United States in Fisher v. University of Texas, supporting the respondent UTexas in the view that race could be used as one of many factors in a holistic admissions process.